For additional information, call the Arboretum at 410-634-2847, extension 0 or send e-mail to info@adkinsarboretum.org. Does the Arboretum sell plants? The Arboretum's Native Plant Nursery offers the largest selection of ornamental native plants for the Chesapeake Gardener. Plants are for sale at Open House & Native Plant Sale events April in September, and through the growing season, mid-April to mid-November. Can you drive around the Arboretum? There are five miles of walking/biking paths on the Arboretum's 400-acre site. A map is available at the Arboretum's Visitor's Center. Automobiles are not allowed beyond the Arboretum's parking areas. Is the Arboretum part of Tuckahoe State Park? The Arboretum is adjacent to Tuckahoe State Park, a 4,000-acre park in Caroline County, MD. The Arboretum receives no state funding for operating expenses and is managed by a private not-for-profit organization. How do I register for educational programs and events? 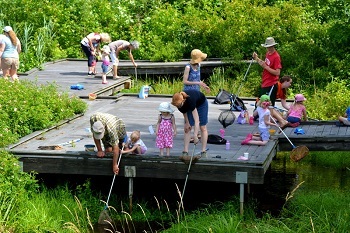 The Arboretum offers guided walks, adult programs, children's programs, and seasonal community events. You may register for these programs by clicking on the Program & Events Calendar or by calling the Arboretum at 410-634-2847, extension 0. Yes. Most of the Arboretum paths are ideal for bikers of all ages and connect to Tuckahoe State Park's trail system. May I bring my cross country skis if it snows? Yes. 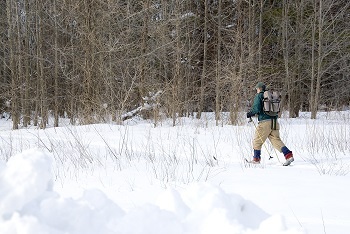 The Arboretum's five miles of paths are great for skiing! Are the paths wheelchair accessible? Most of the paths are accessible. Special arrangements may also be made to assist in escorting visitors with special needs. Please call in advance. Yes, effective January 1, 2005 - general public $5/adults and $2/students ages 6-18. Children 5 and under are admitted free. Admission is always free for Arboretum members. 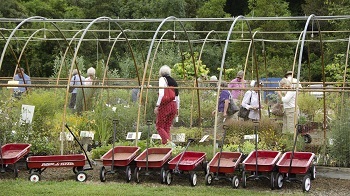 The Arboretum is a growing organization with a small staff. You may inquire about current openings by telephone or e-mail. You may mail or e-mail a resume specifying the type of position that interests you. Internships are also available. Gift certificates may be purchased at the Visitor's Center or by telephone. Are there ticks on your paths? There are ticks. Insect repellent is recommended, and visitors are strongly encouraged to stay on the paths. Do you have poison ivy in the Arboretum? Yes. Visitors are encouraged to stay on the paths to avoid poison ivy. Yes! Leashed dogs are welcome. Guided dog walks are offered every Thursday. Check the Program & Events Calendar for details. Horses are not permitted in the Arboretum, but there is an equestrian center within Tuckahoe State Park. Horses are permitted on some paths in Tuckahoe State Park.